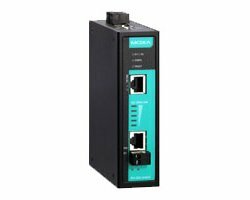 The IEX-402-SHDSL is an entry-level industrial managed Ethernet extender designed with one 10/100BaseT(X) and one DSL port. The Ethernet extender provides a point-to-point extension over twisted copper wires based on the G.SHDSL.bis standard. The device supports a data rate of up to 15.3 Mbps and a long transmission distance of up to 8 km. The IEX-402-SHDSL series is designed for use in harsh operating environments. The DIN-rail mount, wide operating temperature range (-40 to 75°C), and dual power input make it ideal for installation in industrial applications. To simplify configuration, the IEX-402-SHDSL uses CO/CPE auto negotiation. By factory default, the device will automatically assign CPE status to one of each pair of IEX devices. In addition, Link Fault Pass-through (LFP) and network redundancy interoperability enhance the reliability and accessibility of communication networks. Advanced managed and monitored functionality through MXview, including a virtual panel, improve the user experience for quick trouble shooting.